Does Email Spam Actually Work? I’m going to take a break from the long search engine posts and do something a little more fun. I assume that if you check your “Spam” email folder, you’d see familiar topics. Viagra, make money online, random strangers asking for money, etc. Most of them are automatically filtered or, if not, would be clearly spotted as spam by us. The email would have to get past the spam filter. If you’re using Gmail, that is very difficult. The recipient would have to believe the email is legitimate. Seems improbable for most of them. The recipient would have to read the email and click on whatever link was in it. Most of these are from foreign spammers or are written by robots, so this also seems improbable. The recipient would have to think the website is legitimate (most look like crap) and actually purchase the product via the website. I suppose if you’ve come this far this doesn’t seem so far off. I’m sorry, but this is who I think of. Probably true too. The combination of all of these seems so tiny that it would never happen, right? Well, it apparently happens a LOT. Daily Revenue = # Emails sent per middleman * # Middlemen computers * % of emails Delivered * % of emails that get through the spam Filter * % of recipients that Visit the site * % who Buy something * average Purchase price. 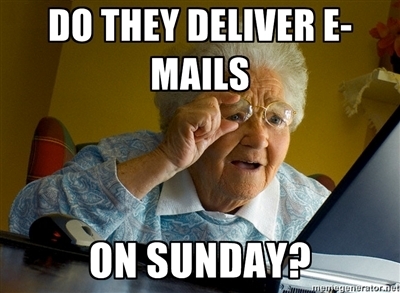 AND, that’s only for the 24% of emails that even get delivered (most go to inactive emails). How is it worth it?! E * M is how. 1.7 million for each of the 550 computers, and remember, that’s daily. That’s 935 million emails a day, or almost 650,000 a minute. After 650,000 emails are sent out, there’s a 5% chance someone purchased something. So, over the course of the day, it takes about 19 minutes to make a $100 sale. How would you like to make $5/minute? Obviously, spam like this is the scum of the internet, but the point is, it’s effective. What if you could find a way to use this power for good? Short of that, what if you used the $2.7 million/year this generates to fund orphanages? Our economy has changed, and there are loopholes aplenty. Something to think about :). Scary. For those of us not as savvy as you… I know enough to not open or click on the obvious ones, but once in awhile a link is not so obvious…. That’s actually a good point, so let me clarify. This really can only work with e-commerce products, and the stuff on the lower end of the price spectrum. You might not do as much research on these smaller items, so a random email might work, whereas someone looking for a doctor or lawyer isn’t just going to buy it online. Hope that helps! Your math is so wrong it’s ridiculous dude. Major fail. It’s funny the different types of people there are in the world. You could have saw what you thought was wrong, figured out how to get it right, and politely commented what the right math was. But you just wanted to say “fail” like you’re some loser in high school trying to make yourself feel better. Nice style. Found the article through Google as I was intrigued myself as to whether people actually did buy stuff! Where did you source your percentages from? They seem high to me, but obviously my expectations already biased my brain into thinking that they should be as close to zero as can be, haha! Also, 0.003% of $60000 isn’t $500, it’s $2. Two dollars a minute certainly isn’t to be sniffed at, but it’s not quite the goldmine the article makes it out to be! I’m guessing there was an input error? As the pie chart certainly shows a far bigger slice than 0.003% too! Hey Sean! The percentages were from the Wired article I linked to, from what I remember. I wrote this 4 years ago so it’s a bit hazy. You are totally right–my math was way off. I tried it again and fixed a bunch of stuff. Ended up being .000008% of 650k emails, which made $5/minute. I think that’s right now? The pie chart is now ridiculous, showing the smallest sliver you could imagine. Ha. Thanks for your help! So, the only weapon against spam is an educated and intelligent population.